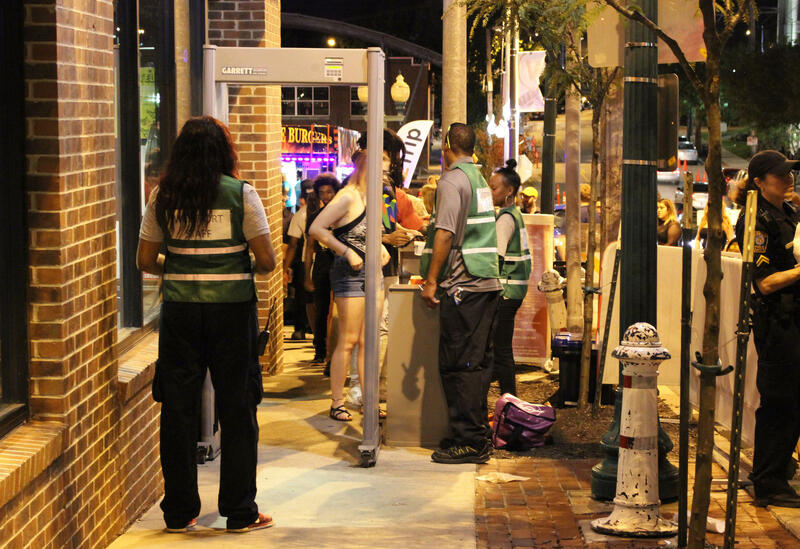 The busiest checkpoint Saturday night was at Mill Street and Westport Road, where a long line trailed down Mill Street toward the parking garage for hours. Kansas City's popular entertainment district looked a little different this weekend. Westport officials announced Friday that the promised gun screening checkpoints, which the City Council approved in December, would finally be active over Labor Day weekend, from 11 p.m. to 3 a.m. Friday and Saturday nights. Although the security company providing the detectors was setting them up throughout the weekend, the metal detectors weren't active until Saturday night, and even then they weren't turned on until midnight. While waiting for the machine to start working at the checkpoint at Pennsylvania and Archibald, staff waved patrons through without checking bags or IDs. But, around midnight Saturday, three of the four checkpoints were in full swing. There was no metal detector at Pennsylvania and the entrance to the parking garage, which was temporarily closed off for entry. At each checkpoint, around three "screeners" — distinguished from security guards and police by green vests identifying them as Wesport staff — checked IDs, searched bags for a laundry list of prohibited items, and wanded patrons if the detector went off. Also at each checkpoint, two to three "civil observers" stood with clipboards. They were hired by the Ad Hoc Group Against Crime to monitor for profiling based on race, gender, sexuality or otherwise. Observer Benny Ford told KCUR their role is hands-off. "We're looking for fair treatment for each individual," he said. "If you card one, do you card the other. We're looking for why a person was stopped or held up, and documenting what we see." Some patrons had to pass through three times before they were allowed entry, turning out their pockets and removing bracelets until the detector didn't go off. This meant lines of visitors were steady at the entrances. "We probably need a couple more because this is a lot of people," Jasmine Meeks said. "But they're all right. They keep us safe." Her friend Cierra Clayborn said she has a daughter at home, and she likes knowing she's going to make it home safely. "If I can come through here and I know they're checking everybody, we're all good to go. So, I'm with this," she said. Callie Michael and his friends said they had a little trouble getting in. One of his friends said he feels like he's treated like a "criminal." As for the detector, Michael said he's torn. "It's a good thing because people come in with guns sometimes," he said. "But if it's here, you're going to stop business. A lot of people might not come anymore. Because of the atmosphere, and the long line. Normally we can come and be free. I think it's going to slow us down." The detector went off when Sydney Garlington walked through. She was surprised to find it was her bracelet that set it off. "It's fake, it's from Forever 21, there's nothing to it," she said. "But I'd rather be safe than sorry. There's been a lot of shootings out here, so it's good." Mycah Russell's watch set it off, which she said made her feel nervous. But overall, she said, this makes her feel safer. Russell said she felt "extremely" unsafe before, though it never deterred her from coming to Westport.